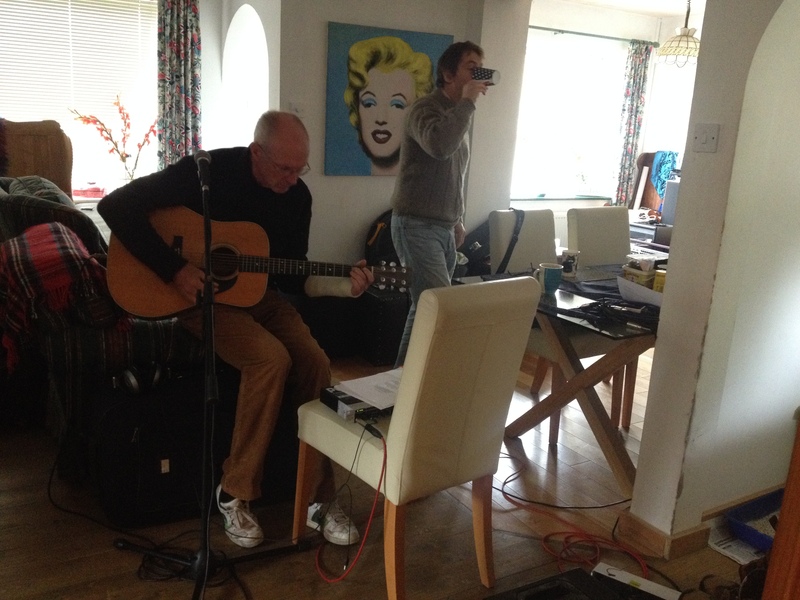 I started writing this post when we’d booked some time together to begin recording the Missing Persians second album – I then saved the draft. I’m typing the text you’re reading now when we’re about halfway through the recording process. 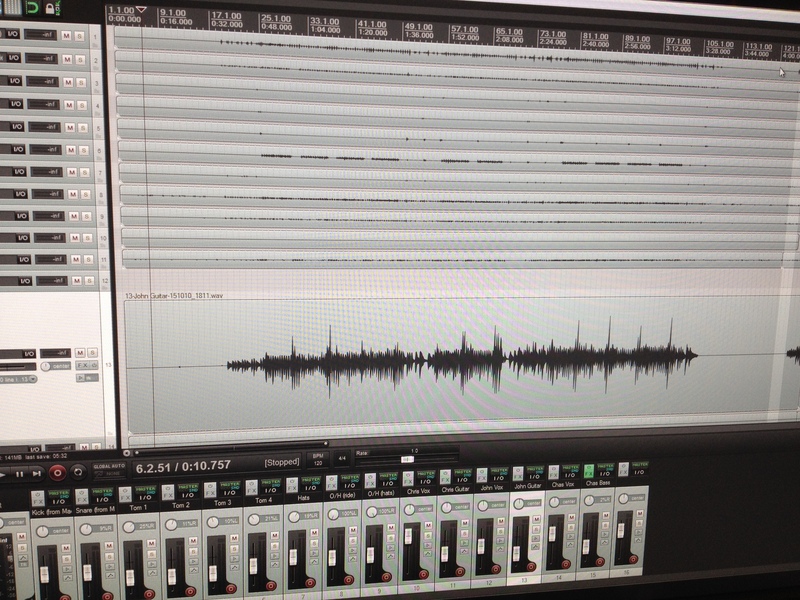 We’re doing it slightly differently this time, but still recording it ourselves and still using Reaper (I’m actually a Cubase man, but Reaper was chosen as a lower cost option which would allow us to take a PC to our own houses to record individual parts without me having to give up my main computer, or getting everyone in the band to invest in Cubase!) Reaper has some idiosyncrasies which I’m not sure I like, but all in all it works quite well. Last time we recorded pretty much everything live except for guitar solos and vocals – but as we didn’t have enough inputs on our sound interface we mixed drums down to a stereo track before going into the computer. This worked OK for most songs, but one or two were discarded due to problems with the drum mix which we obviously couldn’t do anything about afterwards. 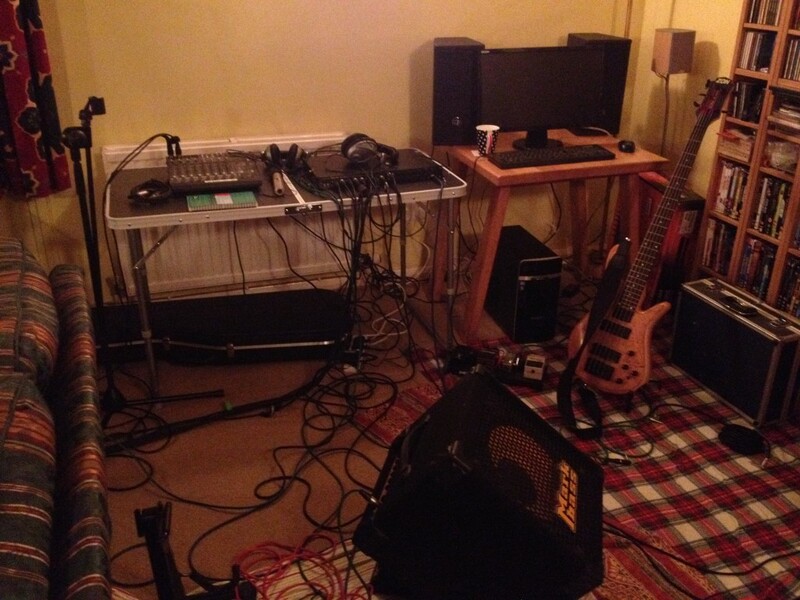 We also had a certain amount of bass and guitar spill on the drum tracks which wasn’t ideal. When I came to mix we had to lose a number of good recordings due to missing a crucial problem with drum sounds or a balance issue, so this time I wanted to do it slightly differently. 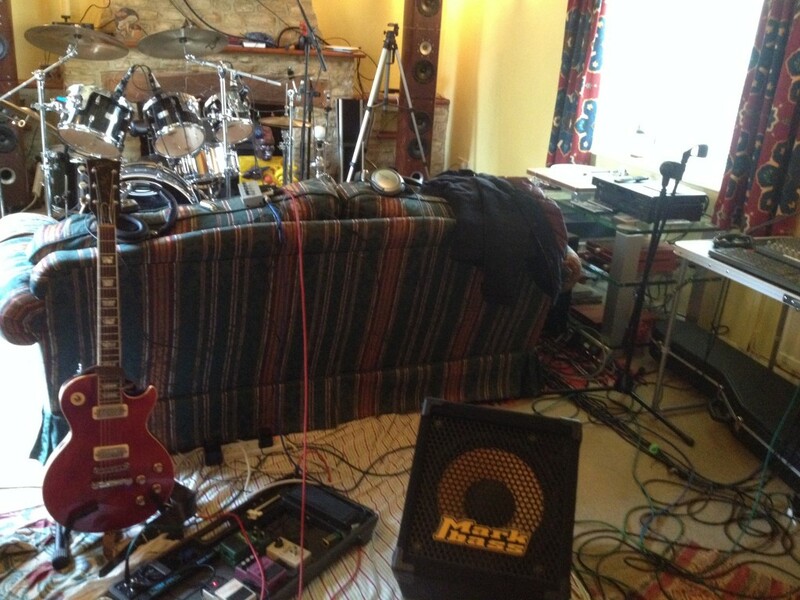 We used the sofa as a sound barrier to avoid hearing bass guitar on the drum tracks. Bass was DI’d out of the back of the amp, so no spill the other way round. 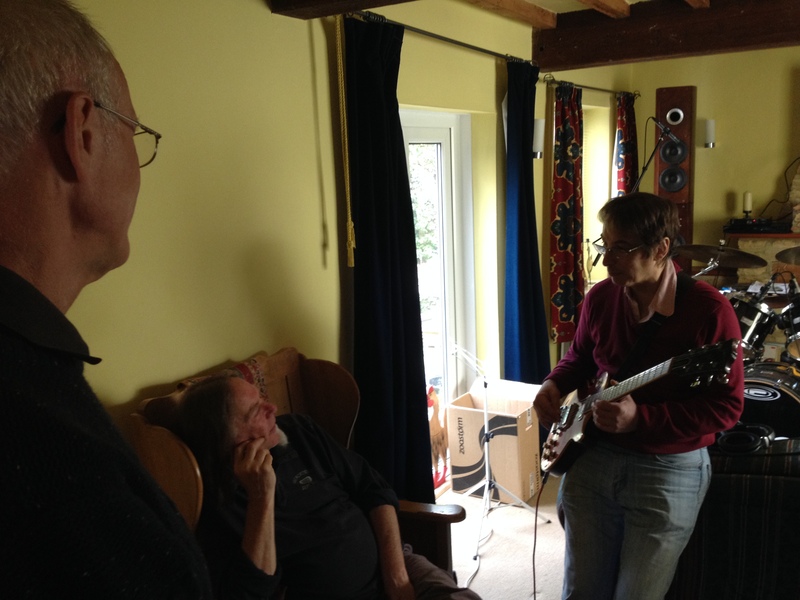 The output from John’s effects was plugged directly into a Line input and we only used it for a guide. We’ll capture the sound of John’s amp when he overdubs later. 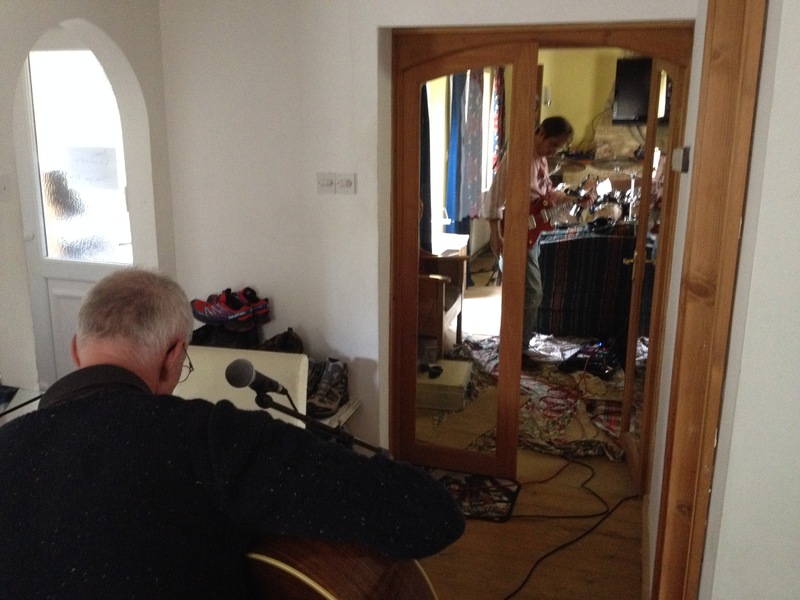 This process is working well so far – we recorded bass and drums at our drummer Nick’s house, and then Chris has taken the PC and is recording his vocals, acoustic guitar and mandolin at his own pace (now that the cast is off he is finding this much easier!) Electric guitar and vocals are being added in the coming weeks. Space Elevator II available 25th May!